Book Blurb: A novel of suspense that explores the complexities of marriage and the dangerous truths we ignore in the name of love. When you read this book, you will make many assumptions. 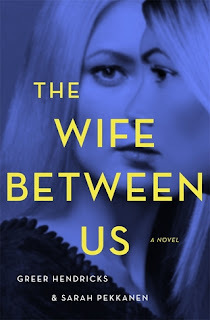 Review: I read The Last Mrs. Parrish not to long ago and had heard about The Wife Between Us being similar. I wasn't very keen on the The Last Mrs. Parrish, but I wanted to give The Wife Between Us a go. I have to say, I have mixed feelings about this one, but I definitely liked it much better than The Last Mrs. Parrish. These books are so similar its kind of scary, but The Wife Between Us has much better writing. As I started reading Vanessa really drove me crazy because she really seemed like a crazy jealous ex-wife that couldn't get her life together, but I keep on reading and I'm glad I did. Part One ends in a twist I didn't see coming but started to make sense. That's when Vanessa starts seeming less like a crazy person and more like a victim. As things go forward, she's much more than that. She's had so many problems in her life and with Richard. Her relationship with him was interesting. I knew from the get go, he was going to figure into whatever was going on and not in a good way. Learning Vanessa's back story is what makes this book. It really gives you a feel for what is happening in the hear and now. What I didn't like was the ending as it pertained to Richard. I did like the sympathy card that seemed be getting played. This book was classified as a thriller, but it never felt like one. There wasn't enough real tension for me, or at least on the edge of my seat sense of worry that something awful was going to happen to make me feel that this was a thriller. That didn't make this any less of an enjoyable read for me though, once I got past part one, I really liked the book a lot.